Extra, extra! 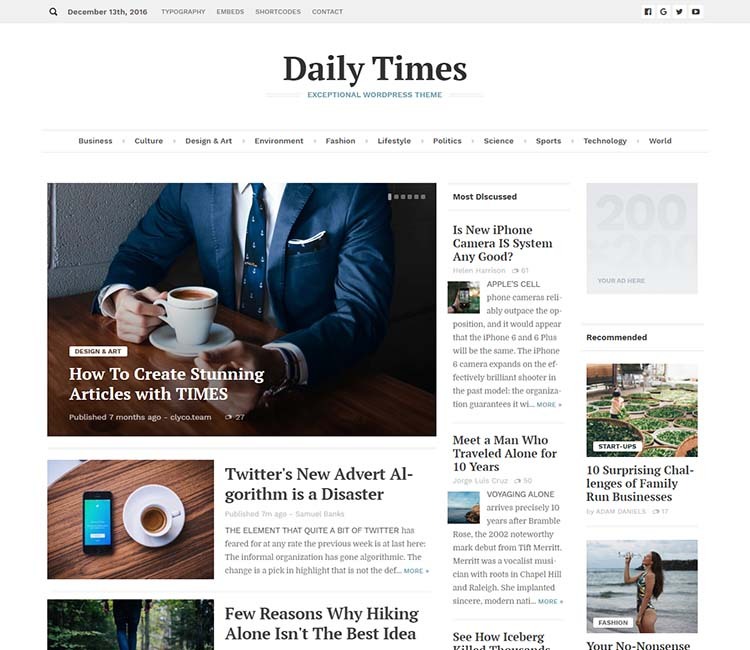 Have we got a scoop for you: the best WordPress newspaper themes for 2019. Maybe you’re a web developer putting together a website for your local newspaper. Maybe you’re an independent journalist looking to become a publisher. Maybe you’ve got something else in mind entirely. I’m not a mind reader. Whatever your motives, one of these excellent news themes should have you covered. Initially, we wanted to put together an article showcasing only WordPress themes inspired by traditional print journalism. We really love the design of major online rags like The New York Times and Washington Post, which nicely capture a timeless newspaper design aesthetic. But it turned out there just weren’t enough of to fill out a list. We turned up a few good picks that hit the mark, but we also opened up our criteria a bit. Some of the themes we ended up selecting more closely resemble other popular news websites, like USA Today and The Guardian. But, hey, maybe that’s what you’re looking for anyway! When making our choices, we looked at both design quality and features lists. We also tried to leave out any themes that were getting long in the tooth, unless they were too strong to omit. There’s not much point in a “best of 2019” list where everything is five years old. But enough about all that, let’s check out some WordPress newspaper themes! 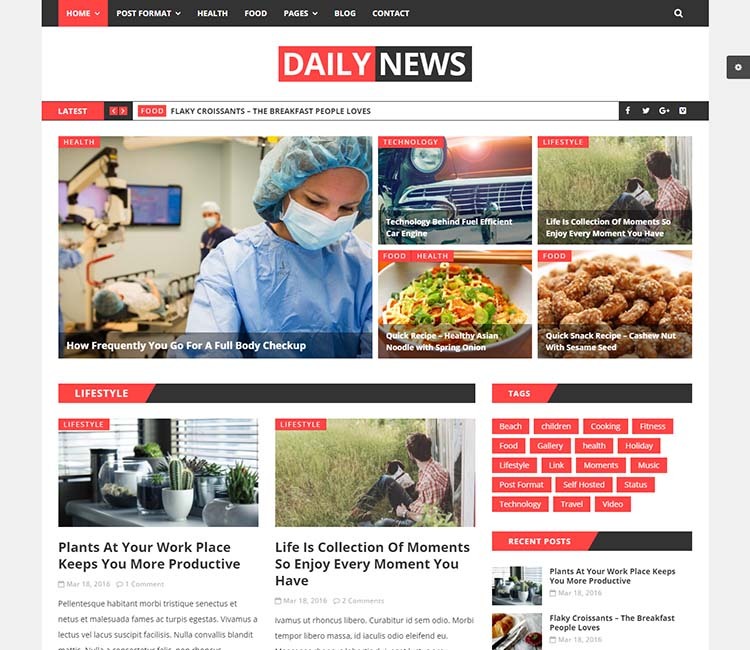 Daily News supports all post formats, and can be easily customized and branded on the back-end via the WordPress Live Customizer. So you can adjust and tweak the fonts and colors (and other elements) and preview the results in real-time. You don’t have to touch a line code. A few other options expand the versatility further, like two header layouts, four category layouts, and three featured areas. Of course, it is fully responsive, and scales to provide a consistent and crisp user interface regardless of the platform you load it up on. A few other usability add-ons like mega menus are a nice touch. Social sharing is smartly implemented, and an author info box is added to the bottom each article. The theme is well supported, and easy to install and set up. More Info/Download Get It Customized What’s the Best Host? Get It Customized What’s the Best Host? The old-school, print design of the Times theme is what we initially had in mind when we conceived of this roundup post. We wanted to find newspaper themes reminiscent of the New York Times and Washington Post websites. What does that mean? Well, we specifically wanted simplicity, content focused design with a lot of white space and lovely Serif typography. Unfortunately, our search didn’t turn up as many as we’d hoped, but we did discover Times, which fit the bill perfectly. This is exactly what we were looking for, and we expect many of our readers arriving from Google (and elsewhere) will feel the same way. The theme includes a lot of great usability features beyond its highly readable design. And integrated bookmarking and recommendation system makes it easy for site visitors to share posts they like and save articles for later reading. User engagement is encouraged by enhanced commenting. Times is, unsurprisingly, flawlessly responsive and retina-ready. The graphics look sharp and crisp on the highest resolution 5K displays, and user experience is perfect on smartphones and tablets. Performance is optimized, and the clean code is SEO friendly to help you rank in the SERPs. Highly recommended. 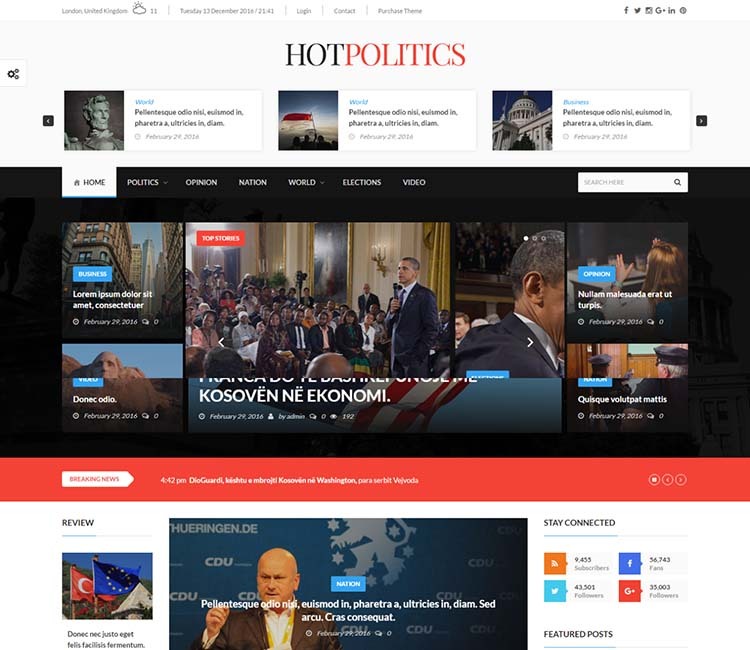 Hotmagazine appears on several of our other roundups, on account of it being a multipurpose theme featuring multiple skins, each targeting a specific publishing niche. One of those niches is politics, and we think that design lends itself wonderfully to newspaper websites. Liberal (and astute conservative) readers and web design aficionados might recognize a passing resemblance to a little known rag called the Huffington Post. But the design deviates enough to have its own unique character. Hotmagazine includes a ton of features, like responsive ad/banner support, to aid in monetization efforts, and a useful review system. Unlimited layouts can be codelessly constructed and deconstructed using the bundled Visual Composer plugin and its intuitive drag-and-drop interface. The theme supports Contact Form 7, for building custom web forms, and MailChimp, to help build your mailing list. There are plenty more customization options on the back-end, too. The theme is translation ready and even supports RTL languages. Our next pick, Publisher, is a similarly clean and modern design, and it packs in a few tasteful visual enhancements via CSS3. It even supports animated thumbnails and featured images, one of the few themes on the market to do so. 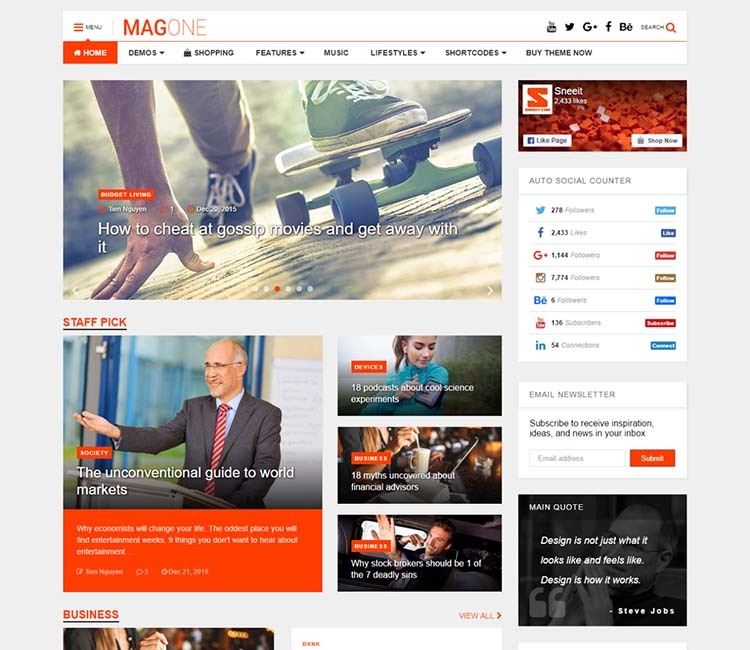 This is a multipurpose magazine and news theme, with 10 distinct demos to choose from. We think the demo titled Pure Magazine is the best match for building a newspaper website. But, hey, tastes vary. Your call. The theme includes over 100 layout presets for the homepage, and it’s a breeze to set up and install using the one-click demo installer. Usability enhancements like mega menus, advanced lightbox, a sticky menu, and a sticky sidebar add to the UX. The trending news ticker is another nice touch. Publisher includes a review system, supports every WordPress post type, and has excellent social sharing features. It even supports WooCommerce and bbPress for shopping cart and forum functionality, respectively. The theme is SEO optimized, implementing schema.org. In terms of just features alone, this is probably the best value/bang for your buck on our list. None of the other feature sets compare. Our only caveat is that it could prove overkill and a bit overwhelming for some users. 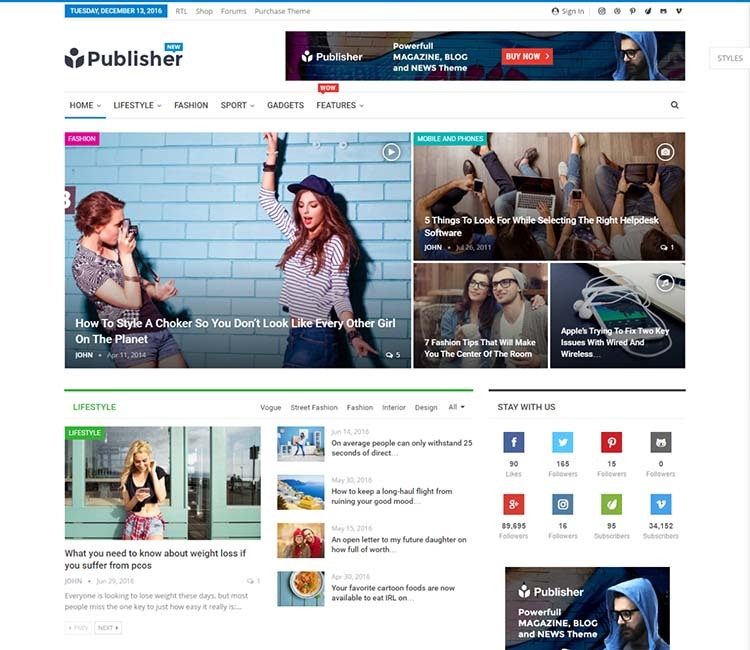 But we highly recommend Publisher for power users and WordPress enthusiasts. We would be remiss not to include Extra on our list, the flagship magazine and newspaper theme from the famous design and development team at ElegantThemes. 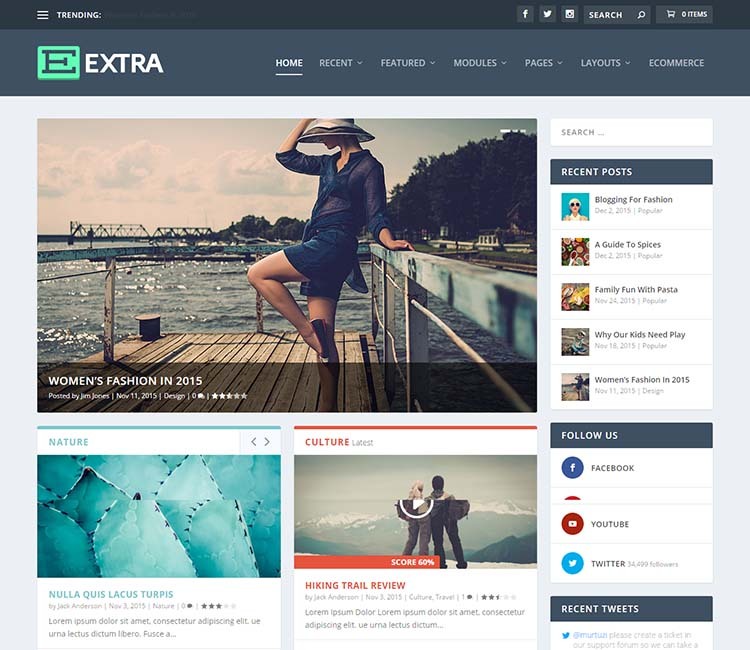 Extra is a remarkably versatile product, powered by ElegantThemes’ proprietary drag-and-drop page builder DIVI. The default design is gorgeous, which comes as no surprise – ElegantThemes always excels on the design end. It’s no doubt always been their greatest strength and a large part of the secret to their success. But in the last couple of years, they’ve really taken it above and beyond on the features and functionality end, too. We recommend clicking through to the product page to get a more complete picture of everything this theme has to offer. A look at the demo will instantly show why we’re so fond of this theme. The designers and WordPress developers TemplateMonster have also upped their game over the past year, consistently releasing some truly great-looking, well planned & executed products. We hope the trend continues. 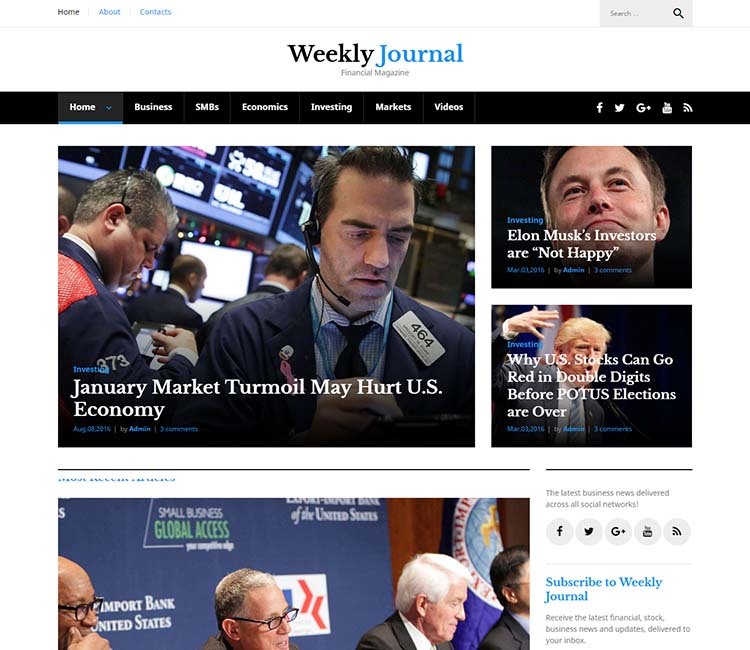 Billed as a financial news theme – we expect the Wall Street Journal had some influence – the classic, content-focused aesthetic, with emphasis on typography and readability, is exactly what we had in mind for this roundup. Its modular design allows for flexible layout, and the WordPress Live Customizer provides plenty control over fonts and colors (and adjustments are previewed in real-time). The theme is well documented, and the support team is friendly and prompt. Fine Globe comes next. This is another theme, like Times, that embraces a familiar, classic-style newspaper design. Although the default demo goes with Sans Serif typography, the high contrast, monochromatic/black-and-white approach effectively evokes the print news of days gone by. In terms of layout, this is hugely (bigly?) versatile theme, partly in thanks to Visual Composer, bundled free. But in addition to Visual Composer page building, which virtually supplies unlimited homepage layouts, users can choose between seven headers, seven footers, seven single post layouts, and seven category page layouts. Why seven? Well, who knows. Why not seven? The theme is built on Bootstrap, and an easy to use options panel leaves more open for customization and adjustments. The theme also supports mega menus! Woo. Magone is a multipurpose magazine and news theme that, like Hotmagazine (featured above, if you’re skipping around), appears on a few of our other lists. There’s currently 12 unique homepages to choose from, and the theme features flexible headers and drag-and-drop page building. Notable secondary features include space for advertisements, mega menus, and a ratings & review system. The theme promotes user engagement via multiple commenting systems. Magone is mobile-friendly, translation-ready, and all that other good stuff. There’s not much sense in using the theme isn’t 100% responsive in 2019, right? We certainly wouldn’t include it here if it wasn’t. We can’t help but notice that our next election, Newsroom, bears a striking resemblance to the popular Wired magazine website. But that’s cool – it’s a great looking site. Once again, the high contrast B&W design also taps in to a classic print aesthetic. The theme includes six unique homepages, and lots of great features like integrated social sharing, mega menus, and post sliders. Newsroom supports WooCommerce and bbPress for adding shop and an online community to your publication. Visual Composer and Slider Revolution are bundled free. Also–and it probably goes without saying–Newsroom is responsive and translation ready with WPML support. 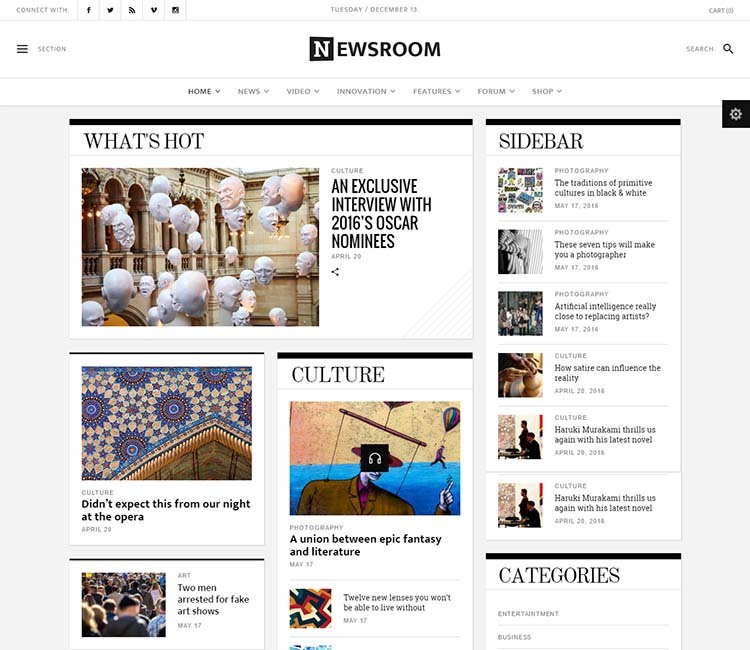 Newspress is a streamlined, user-friendly theme with just the right amount of flexibility. Although we realize many readers will gravitate toward larger, more feature packed products, we think there’s a lot to be said for focused design. The five homepage variations offer just the right amount of versatility without being all over the place, or overkill. Drag-and-drop page building is provided by Visual Composer (bundled free, of course). The theme supports Contact Form 7 for putting together custom web forms. MailChimp integration helps you build your mailing list and promote your newsletter with a handy pop-up. The theme is built on Twitter Bootstrap, and the code is clean and SEO friendly to help you grab a top spot in Google. Our last spot goes to Newsstand. 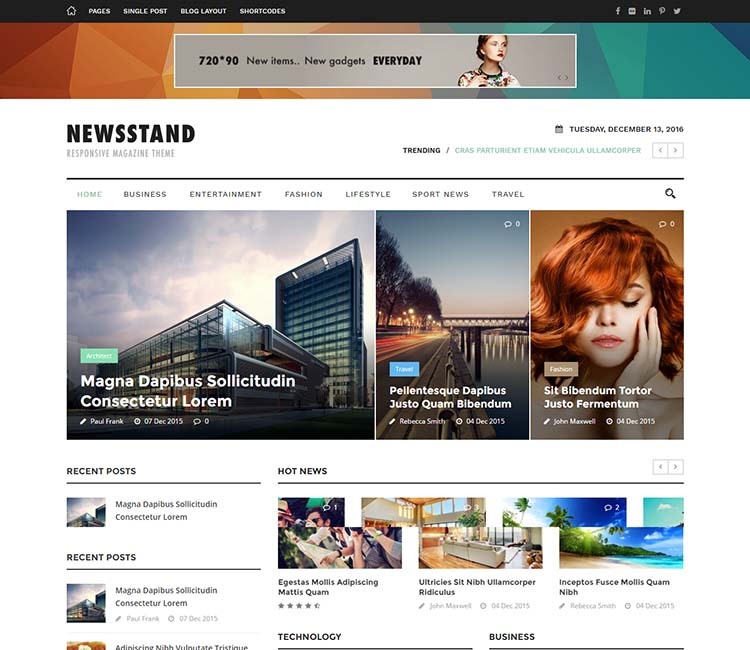 Newstand was developed and designed by one of our favorite teams on the ThemeForest marketplace, Goodlayers. These folks know what they’re doing: they’ve sold almost 150,000 WordPress themes to date. That sounds like a lot of work. In addition to three demo layouts, the theme includes drag-and-drop page building, responsive and retina-ready design, WooCommerce and WPML compatibility, and one-click demo installation for stress-free setup. Check it out! One more thing: if you’re looking for magazine/newspaper theme under $20, click here for the best cheap WordPress themes. All the themes look great but I will choose based on the speed of the theme. Can you specify which one is the fastest loading theme of these?